When you listen to one of your favorite songs you become aware to the fact that it is built up of notes and chords that are changing and causing the song to evolve in a way that is pleasing to the ear. Why do some chords sound good together and others sound absolutely terrible? 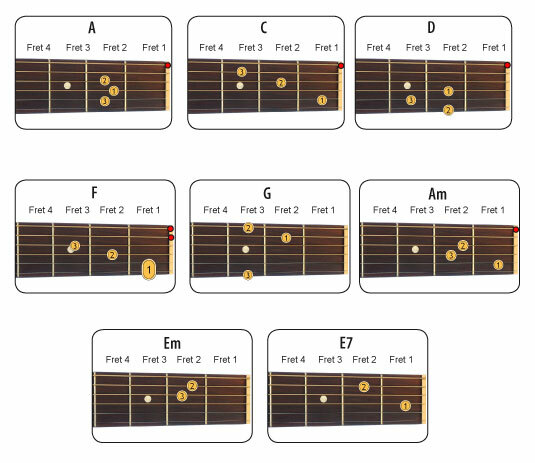 It might be a good idea to get your guitar out at this point and just have a play around with the notes in the above scale so you can hear what I mean about strong movement between numbers 1, 4 and 5. Also, play around with some of the other numbers to see what some weaker movements sound like. So now that we have established the above fact, let's use it in some chord progressions. Try playing the above chord progression using a strum of your own. If you don't know the chords, they are shown at the bottom of this page - you will hear that the progression sounds good and repeats itself through a strong chord movement.